English Skills is a requirement for any CCHS student with more than one credit of English to finish. It is the first class all students take - a five-week long "mega module" introducing the basic reading, writing, speaking, and listening skills used throughout all subjects at CCHS. What is the value of learning the writing process, rather than just putting something down on paper? How do we break down texts to understand them better? The student will utilize reading strategies to read for comprehension and analysis. I’ll be here to guide you on your path to writing ninjahood (just call me Sensei Christine). However, success lies in your hands. You are expected to work independently in class every day. Credit will only be given for “B” work or better (“capable” on the Writing Scoring Guide). Sub-standard work will be revised. All work must be legible to receive credit. Final drafts must be typed. Any discrepancy about grading must be argued through writing. Student behavior expectations will follow the 6 P’s and attending skills. Student consequences will follow the 3 redirects. All students must come to class every day. If you are in the building but have not checked in with Christine, you will not receive attendance. 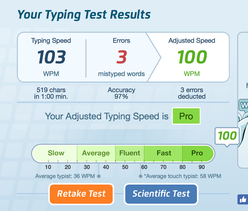 Ok, here's your challenge: can you beat my typing score? Write about whatever you want for 10 minutes. It can be on a specific topic or stream of consciousness (whatever comes to mind) - as long as it's school appropriate. Stuck for ideas? Write about your day, observe things in the room, write about what you'd rather be doing in this moment... just keep writing! Finish work for the English Skills credit! If, somehow, you lost your handbook, please DO NOT print one here... let me know, and I'll get you another one. The handbook is here just for added reference.